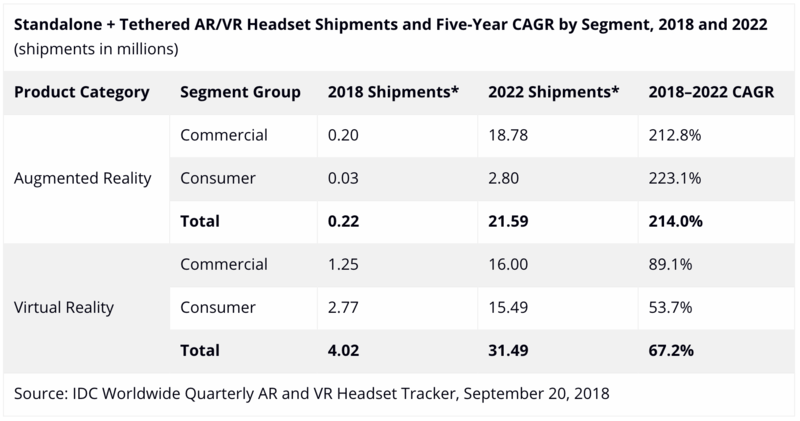 FRAMINGHAM, Mass., September 20, 2018 – Global shipments of standalone and tethered Augmented Reality (AR) and Virtual Reality (VR) headsets are expected to total 4.2 million units in 2018, up 31% from 2017. Looking ahead to 2022, shipments for these headsets is expected to rise to 53.1 million units with a compound annual growth rate (CAGR) of 88%, according to the International Data Corporation (IDC) Worldwide Quarterly Augmented and Virtual Reality Headset Tracker. Although screenless viewers have accounted for a significant portion of the market to date, these headsets will continue to lose relevance as volumes decline and growth drops to a CAGR of -1% over the 2018-2022 period. "IDC has updated its forecast to push growth for AR headsets out further as AR progress on smartphones and tablets continues to outpace that of headsets," said Jitesh Ubrani, senior research analyst for IDC Mobile Device Trackers. "Apple's ARKit has continued to improve the fidelity of AR experiences on iOS devices, Google's ARCore is becoming available on more Android devices, and third-party SDK vendors such as 8th Wall and PTC continue to drive innovation in the space." While most consumer-centric AR apps are focused on smartphones and tablets, commercial AR is driving shipments for standalone and tethered AR headsets. IDC expects the category to surpass the 1 million mark by 2020, after which the growth will dramatically increase. As more vendors enter the market, additional use cases come to fruition, and prices decline, we expect total shipments in this category to reach 21.6 million by the end of 2022. "AR headset growth may seem muted, but it's still very early days in this market," said Tom Mainelli, vice president of Devices & AR/VR at IDC. 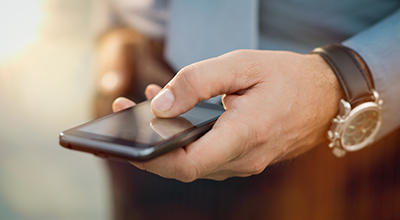 "Right now we're seeing vendors build out enterprise-focused software for the devices available today with an eye toward the new features that will become available in future iterations of hardware. Things will get very interesting from a volume and capability perspective in the months to come." Despite the recent downturn in the VR headset market, growth in this market will return in 2019 as global shipment volume jumps to 8.6 million headsets. Much of this growth will be due to the increasing adoption of tethered and standalone devices – particularly on in the commercial segment – combined with the decline in screenless VR headset shipments. Note: Shipment Data for 2018 and 2022 are forecast projections.